Program Coordinator for Maniema Province Coordinator for Maniema Province. In 2007 Ohm was teaching science and math at a secondary school in Opala when he heard about the TL2 project’s Lomami exploration. He applied, was accepted and, for the first time in his life, started to work in the forest. One of the field leaders, Papa Maurice chose him, even though the other field leader, Bernard, thought he was too young and not strong enough. He chose a stronger and older guy for his field team. But Papa Maurice said, ‘No, this boy can work!’ He wanted to give me a chance. So I could join his field team. “It was not easy! It really was not easy! I was the compass man. I was not doing well; sometimes I could not even eat. We were in really dense forests. I thought to myself, ‘What is this? !’ I kept asking Papa Maurice: ‘Is this job really like this? Because I am leaving right now!’ And that was only after 4 days… It was a test trip to see if we were capable. It was tough. But, I decided to try it one more time.. The second mission was to explore the region of Ikela, and this time we went for 17 days.” – That is how Ohm started to work in the TL2 Project. 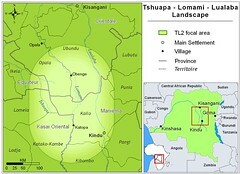 Ohm was born on 17 May 1984 in Opala, Tshopo Province. His father died when he was a baby, and so his mother was left alone with him and his 2 brothers and 3 sisters. His mother tried to make ends meet as a saleswoman. Now Ohm is married with three children. After his rocky start, Ohm has assumed many different jobs within the project. He is proud to have followed the lesula (Cercopithecus lomamiensis), the monkey discovered by the project. He observed their behavior, their feeding habits and their daily activities. He also took part in the monitoring of bonobos. Now he loves the forest and its animals, and he cannot imagine his life without them. 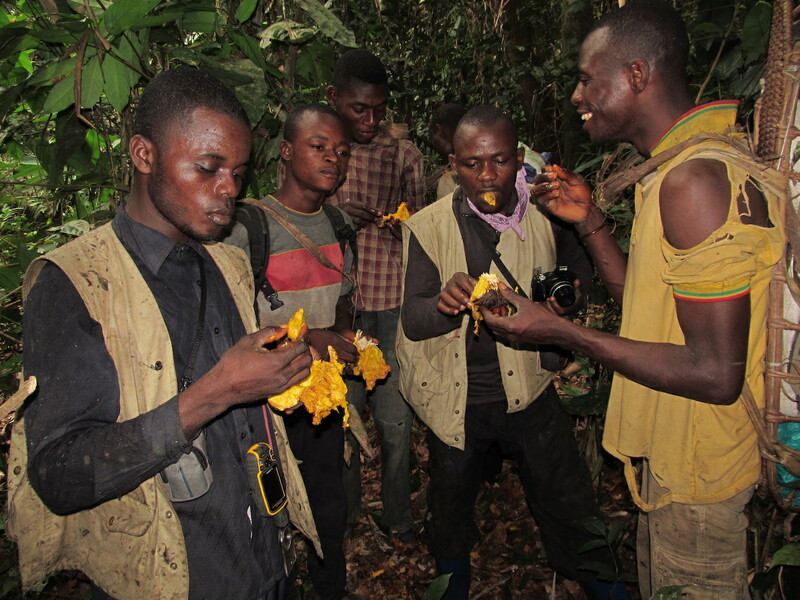 Ohm (on the left) sharing fruits with the field team. With time he started to learn how to use GPS, he became an assistant field leader, and later a field leader. 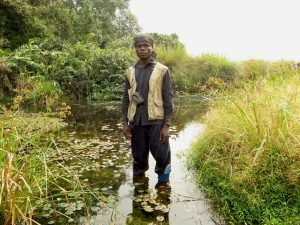 With the support of the TL2 Project and US Fish and Wildlife Service, in 2016 he finished a 2-year training course in park management at Garoua College (Ecole de Faune de Garoua) in Cameroon. He says that progressing is very important, and so he keeps learning. He is responsible now for coordination of field activities in Maniema Province; he supervises the field camps, data collection and archiving, and he keeps in touch with the political authorities. He has to be mobile and flexible, he is often on the road. 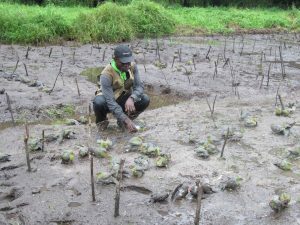 He says: “if you stay in the same place for a long time, you won’t understand what is going on out there, and you will miss the real problems, so you won’t be able to solve them.” He considers himself to be a field person, and his favorite part of the work is the monitoring of animal populations. 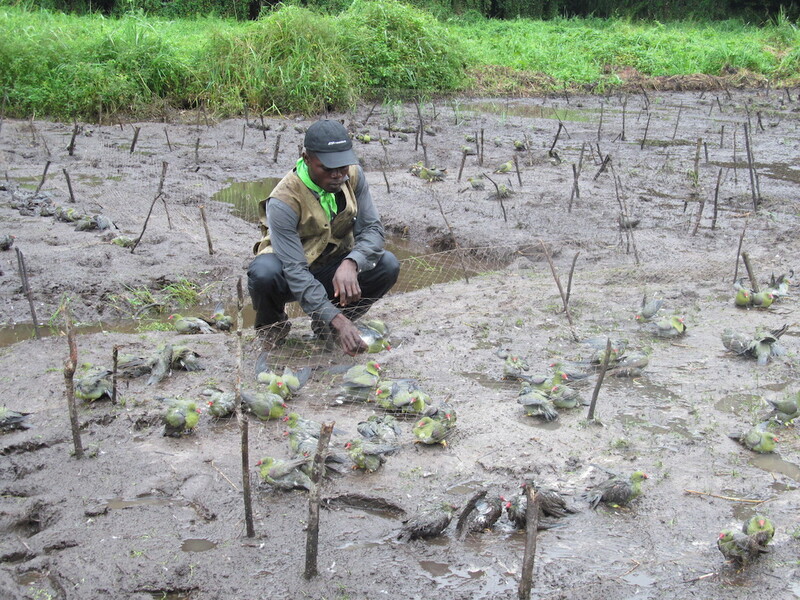 Green pigeons caught in nets strung over the salt mud.